We should rethink the value of water by learning from arid areas. Picture by Sylvain Richer de Forges. Fresh water depletion has been identified as one of the most problematic and impactful issues that we will have to face during the century. Yet, in most modern societies treated fresh water is wasted in large amounts while at the same time many places are facing imminent severe water shortage. We should rethink the value of water and learn from places which through water scarcity have come to understand its value. Fresh water on Earth is very valuable for us humans as it is our lifeline for survival but also indispensable for a range of practices for which we are totally dependent on, including agriculture. Despite that we live on a “water planet” only about 2.5% of the total amount of water on Earth is fresh, the vast majority being stored in the oceans in a salty form. And amongst these fresh water storages, only a small fraction is readily available for consumption. Indeed, fresh clean water is provided in a very convenient way: we switch on the tap and water comes out. However, most of us never bother to think where the water comes from and through which processes it has gone through so that clean consumable fresh water is pouring out from our taps. We tend to forget that the water we drink, the water that we shower with, the water that we waste so easily requires complex treatments which are both very energy intensive and costly. But most of all, we have forgotten that fresh water is a scarce resource which takes a long time to renew itself through natural processes. Overconsumption: With rapidly growing global population and industrialisation comes an exponential increase in water demand both for individual consumption and industrial use. In fact many aquifers and fossil water storage are running dry and more and more rivers no longer reach the sea because so much has been extracted along the way. Climate change: As the climate shifts, it will greatly affect and modify the distribution and availability of fresh water on Earth. Many communities which have been so dependent on natural cycles for their water consumption and agricultural needs will be severely affected. Contamination: With industrialisation also came pollution and especially the contamination of fresh water supplies. Stored underground water that used to be consumable have become so polluted that they now require expensive treatments. While many nations have benefited from seemingly unlimited supplies of fresh water for decades, many places around the world have had very restricted available supplies of fresh water to rely on and have learn to adapt and value this resource. Two scenarios occur: In some places water is simply too difficult to access to waste any of it, while in other places water is available but contaminated and the cost of treated water is expensive for poor communities to have the luxury of wastage. In such places, water is clearly the most precious resource and its usage is restricted and valued. All aspects of how water is managed are based around conserving the resource with practices such as no wastage during transport; storing the water and reusing every drop (e.g. close loop irrigation); but most importantly the resource is consumed wisely knowingly of its value. Citing Antoine de Saint-Exupery: “What makes the desert beautiful is that somewhere it hides a well”. As water becomes rarer, more difficult to reach and more expensive to treat, we will come to understand its value like they have done so in arid areas, but it may be too late. Unless significant breakthrough to find much cheaper ways of treating water, current technological processes (desalinisation and waste water treatment) do not provide large scale solutions to the water crisis; the cost of the process is simply too expensive and energy intensive. Indeed, a single modern desalinisation plant costs hundreds of millions of US dollars! While convenient for wealthier nations these technologies seem unrealistic for most developing countries. The cost of tap water (treated water) in developed countries does not reflect its value and is therefore abundantly wasted. Yet, controversially the sale of bottled water is one of the most successful drink businesses and a single bottle can cost more than 20 US$ for 500mL! There seems to be a paradox here: we are willing to pay an expensive premium on water which is naturally purified. However, treated tap water remains low while the treatment cost is very high. Confusions in the value of fresh water are synonymous with instability and likely coming changes in water prices. At the end of the day, as fresh water resources deplete, the cost of water can only go up. We can therefore expect the cost of consumable water (both treated and untreated) to rise significantly throughout the century. To avoid this scenario significant advancement in the way water is used and produced would need to be found. Despite that improvements in water treatment have been achieved, there is not a clear solution to date on how to provide clean water at low cost on a global scale. While most of our efforts have been put in technology improvements (desalinisation and waste water treatment), relatively little efforts have been put in finding more passive ways of cleaning large bodies of water using natural filters (e.g. plants) or other passive means that do not require significant energy inputs; because in fact the water treatment challenge is an energy one. At the end of the day large scale water management comes down to maintaining healthy ecosystems. In natural environments, water is purified through the work of organisms and substrates filtrations. If we preserve ecosystems, we also ensure the purity of the water supplies. Another apparent reality is that we should come to better separate lower treatment grades and consumable water. 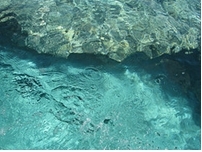 Still today clean treated water is simply wasted for applications which do not require it to be thoroughly treated (e.g. cooling in industrial processes, irrigation…). As a general rule the more purification required, the more energy intensive and expensive the process. Wastage could be greatly reduced with better management of clean treated water. It appears clear that the future will require to diversify water sources including capturing rainfall and storing it and that ways to reduce the treatment cost need to be found.